In the very near future, a mega-corporation, Omnicorp, has taken on the responsibility of protecting mankind by developing robotic answers to the most dangerous situations man can face. Their motives are by no means benevolent; they simply see an opportunity for profit and a market that will never dry up. Their mission to bring their robotic security forces to the police forces of the United States is faced with the obstacle of a public that fears emotionless robots roaming the streets. Omnicorp chooses to ease the minds of the public by merging man with machine to reap the benefits of a machine’s efficiency with a man’s conscience. Robocop is a character/brand that was created nearly 30 years ago and made famous by director Paul Verhoeven and originally played by Peter Weller. When the first film was released in 1987 it was regarded as a success both critically and commercially. That original film would spawn two sequels, a comic book, video games, action figure lines, 2 animated television adaptations as well as 2 live action television adaptations. It became a truly lucrative brand that was able to endure for over 25 years. Unlike the Hollywood of the 80s, Hollywood today does not seem to really have any inclination to develop any new ideas into successful films. Instead, the popular course s of action are to find a teen novel, comic book or established brand from days gone by to adapt or remake into feature films. 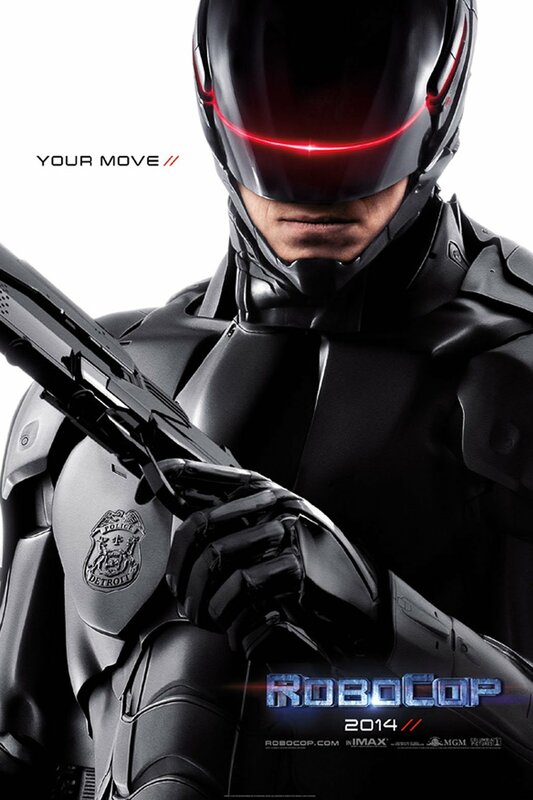 RoboCop is the latest attempt by Hollywood to draw success from that well. This incarnation of RoboCop is not a sequel to the original film series and it is not attached to any of the other parts of the RoboCop franchise. It is intended to reboot the once lucrative brand by using similar themes, a similar story and state of the art special effects to bring the movie to a whole new generation of fans while also reinvigorating the original core fan base. The story is very similar to the one that was presented in 1978. A few changes were made to accentuate the family aspect of the man Alex Murphy. His wife and a son are more central to the story to add emphasis to the human side of RoboCop. Another change is in the portrayal of the company Omnicorp (OCP); it is not portrayed as being wholly corrupt or “inherently evil” as it was in the original series. But overall the story is the same; A Detroit cop is mortally wounded and would be dead if not for the scientists of Omnicorp who rebuild him into a crime fighting cyborg. In this type of movie, the visuals are the key to it being watchable at any level. For the most part, the effects are very good if not excellent. I was only able to find one scene where they could be a little better; look out for the SWAT truck crashing into the ED 209 and you will see what I mean. The effects in the scenes of Murphy in his “human” capacity are striking as he is significantly more machine than man. RoboCop as a character is very well done; he doesn’t look over-the-top or ridiculously fake by any stretch. He looked good both as prosthetics worn by Joel Kinnaman, who was chosen to portray Detective Alex Murphy, and as pure CGI. How many times have we all seen robo-characters that have prosthetics that look like they are out of a Power Rangers TV episode? The first time the visor drops down over Murphy’s face and that pistol comes out, you can’t help but smile with approval. Also related to the effects, the sound effects are believable as well. The producers and director decided to not have RoboCop sound like the voice modulator in a Tandy 1000. Joel Kinnaman actually got to use his own voice unlike Peter Weller in the 1987 original. Also, the use of arbitrary “robot” sounds was kept to a minimum; I don’t need to hear every little motor and gear whine and turn as the movie goes on. The only opportunity for improvement with sound would be when RoboCop walks. His footsteps sound like he should be creating 2 inch impressions in concrete everywhere he goes. As good as the effects are they would be nothing without some good actors to tie it all together. The casting for the movie was really well done as a whole. Gary Oldman as Dr. Norton was an excellent choice. Also, the casting of Michael Keaton as the “villain” was perfect; his portrayal of Sellars really allowed you to see all the layers that make up the Omnicorp CEO. The character of Pat Novak played by Samuel L Jackson does get a little old, but Sam manages to work in some of his trademark dialogue to help him get by. Overall, I really did enjoy this movie. They didn’t screw with the story too much, the visuals and sound are good and the actors all seemed to fit into the roles they were playing. I am not saying to be ready for any type of award caliber stuff here. All I am saying is, if you go to the theatre and plop down $10 to see it, you should leave feeling okay about the decision. Oh, and be ready for sequels….many!